You might think that handwritten cover letters are a thing of the past, but that’s not always the case. 99% of the time employers want typed letters, but every once in a while they ask for a written letter. For immediate consideration, please fax a handwritten cover letter and resume. Submit resume and handwritten cover letter. Please submit a resume with a handwritten cover letter. As our required documentation is very detailed, your handwriting is very important to us. Please email or fax a handwritten cover letter and typed resume with Attn: Hiring Manager. You might be asked to submit one because the job involves writing and your handwriting needs to be legible. It’s also a way to check out your spelling and grammar. As you can see from the last example if an employer is asking for something handwritten it’s important that your penmanship is perfect. Handwriting can seem like a lost art in a time when almost everything is done on a computer, so take the time to get it right. You can write the cover letter on computer paper, that way it will match your resume and will be easy to scan if that’s how you are going to send it. You could also opt for a higher quality stock paper to make a really good impression. Use black or blue ink and a quality pen. You may need access to a scanner and a fax machine. If your handwriting isn’t neat, practice writing by copying another document. Remember what you learned in elementary school, and practice a few times until your writing is clear and legible. Printing your letter is fine, especially if your cursive isn’t very readable. Keep your letter short and focused on why you are the best candidate for the job. Relate your experience to the employer’s requirements. 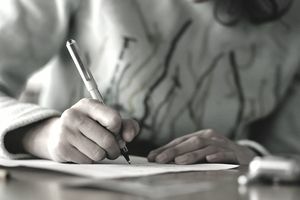 The first paragraph of your letter should explain why you are writing, the second explains why you are qualified for the job, and the third thanks to the employer for considering you for the job. To be sure it's perfect, compose your letter on your computer, spell check, and grammar check it, then print it and copy it. Be sure to format your cover letter as you would a typed letter including your contact information and the contact information for the employer. Write a rough draft of your letter so you can see how the spacing, paragraphs, and format look on the page. The employer is evaluating more than your penmanship. They are going to be reading your letter for content and style, as well. Reread your letter one more time to make sure it flows before you write the final version. Write the final version of your cover letter using a good quality pen. Leave room for your signature. Sign your letter with your full name (first name, last name) and make sure your signature is legible, not a scribble. Even if you print your letter, your signature should be written in cursive. With a handwritten letter, you are going to need to scan it to apply online or via email. If you have an iPad you may be able to use an app to scan your document. If you don't have a scanner or an iPad, check with office supply and shipping stores like FedEx Office Stores, UPS Stores, Staples, etc. You should be able to scan it for a nominal fee. You can save the scanned document as a PDF file on a flash drive or email it to yourself. Employer requirements vary, so follow the instructions in the job posting to apply. Know how to correctly mail a resume and cover letter. If you’re emailing your application, make sure to attach your applications materials to an email message. If you don’t have a fax machine, you can use an internet fax service to send.